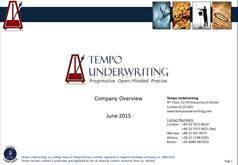 London, UK – Tempo Underwriting (http://www.tempounderwriting.com) announced today that Alsu Chalikova has joined the firm as a Professional Lines Underwriting Assistant where she will focus on developing and underwriting PI and D&O business emanating from Central & Eastern European countries. Alsu joins Tempo from Atradius N.V. where she was responsible for pricing and account management for trade credit insurance. Prior to Atradius, Alsu spent more than two years with RK Harrison Financial Risks as an insurance broker responsible for account management of global accounts with a focus on surety bonds and credit insurance.